Sims Crane & Equipment is the only name to trust when you need hoist elevators, crane rentals, crane service, and more. For over half of a century, we have been industry leaders, and we are renowned for our vast equipment inventories, exceptional customer service, comprehensive safety training and education practices, and value-added services. When you partner with Sims Crane & Equipment for all of your crane service, industrial equipment sales, equipment rental, and equipment maintenance needs, you can rest assured that you are receiving the highest-quality products and services available on the market. Our hoist elevators, or material hoists, are built to last and won’t breakdown on job sites. They are specially designed to quickly vertically transport tools, materials, and more hundreds of feet into the air. With quick and easy setup times, your crew won’t be stuck on the ground, and your projects will be completed on time. And, with additional safety features, you can take comfort knowing that everyone at and around your job sites will be safe during equipment operation. You can purchase or rent hoist elevators, along with forklifts, mobile cranes, crawler cranes, tower cranes, rough terrain cranes, all-terrain cranes, and more from each of our 13 Florida locations. Rentals are available for daily, weekly, or monthly rental periods, and flex-time rentals are also available for those with tighter budgets and flexible timelines. In addition, we gladly offer manned rentals and have over 250 NCCCO certified operators, riggers, and flagmen on staff. Bare lease rental options are also available for those who have the personnel on hand. 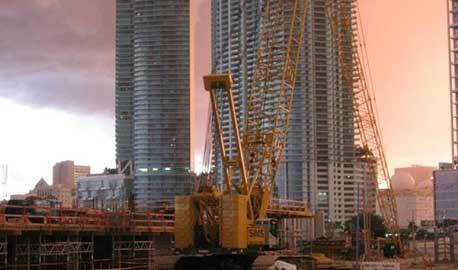 Why Sims Crane & Equipment? While our culture of safety and professional approach to Preview (opens in a new window)transparency are what attracts most new customers to our doors, it’s our trade-craft expertise, reliability, and flexibility that keeps them coming back for future projects. Our equipment is well-maintained and frequently serviced, but we also offer 24/7 crane service in the event that equipment rentals or privately-owned equipment breaks down. Better still, we can provide builders and contractors with 3D lift planning, in-house engineering, movement of traffic, crane safety training, free site consultations, machinery moving, and more. Our equipment has been used to construct many of the amusement parks, high-rises, bridges, retail spaces, and government buildings throughout Miami and across Florida. Contact us today if you are interested in hoist elevators, crane rentals, crane service, equipment sales, or have any other industrial equipment needs.